Maverick Fine Western Wear in the Fort Worth Stockyards. For the past 25 years, Maverick Fine Western Wear, also known as the Maverick, has been a Stockyard staple. The store is famously known for its unique focus on boots, brews and excellent customer service. 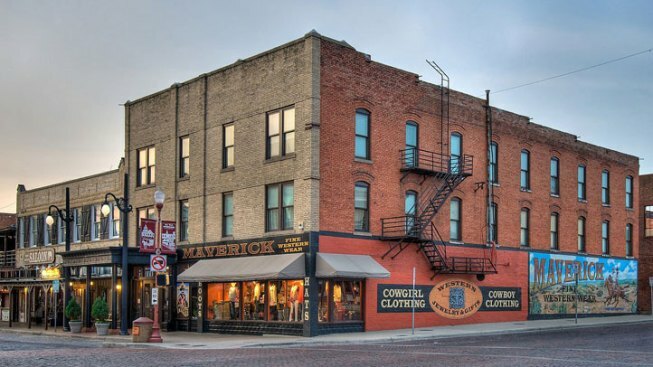 The store, located in the historic Maverick Hotel building established in 1905, prides itself in sticking to its historic Cowtown roots. According to the store's website "patrons of the Maverick can 'belly up' to the bar, relax and have a cold beer while in the Stockyards; just like they did in the days of the big cattle drives." The current bar was built and installed during the 1970's when the Maverick building housed a private club. "There didn't seem like any good reason to tear down a perfectly good bar," said owner Gayle Hill. "Besides, folks need a place to sit and relax a while if you want them to have a pleasant shopping experience." The Maverick also boast about its staff, self-proclaimed "the finest in Texas." The store was recently mentioned in an article on Forbes.com as a brand that deserves a Valentine, due to its excellent customer service. Sales associates send iPhone photos of new merchandise to customers, deliver purchases to customers home whenever possible, and even throw parties for the regulars. "We really try to give our customers superior service because they deserve it, " said Hill. "They have gone through the trouble to come into our store, and we want them to be glad they did." Since it's founding in 1987, the Maverick has served celebrity clients such as Loretta Lynn, Eric Clapton, Hootie and the Blowfish, and Pat Green. Although the store is a popular tourist destination, the most interesting visitors are the Stockyard regulars. "Cowboys, the genuine articles, still walk our streets and shop our stores daily," said Hill. So what plans does the Maverick have for the next 25 years? "We are pretty much bursting at the seams," said Hill. "We hope to increase our online business in the future." The Maverick is just one of the many stores that make up the Fort Worth Stockyards. The store considers the surrounding western stores as community rather than competition. "I hope that we are all creating an area where lots of people want to shop often," said Hill. "Since we're all here together, it's a great drawing card for an individual looking for anything western." Maverick Fine Western Wear will officially celebrate 25 years in August. More information can be found at www.maverickwesternwear.com.